She had always harboured an enthusiasm for working with people from different backgrounds, and her undergraduate degree at Trinity College Dublin only served to reinforce that belief. "I studied a BA (Hons) Sociology and French, and looked at factors affecting the integration of migrants and refugees in society," says Laura. "It led me to find ways of working with new communities in Ireland and after graduating, I volunteered as an English teacher with migrant communities in Dublin. This included a year working with the Separate Children's Education Service and the Horn of Africa People's Aid where my role was to help teenagers from Somalia and Angola with their language skills so that they could adapt to the Irish school system and life in Ireland." In addition, Laura also taught English to migrant women from Eastern Europe and set up a job club to give them networking opportunities, before she returned to university. "I pursued an MSc International Relations from University College Dublin which helped me to develop a deeper understanding of migration and global justice issues," she says of the experience. "Afterwards I worked a an Information/Legal Officer with New Communities Partnership, a migrant-led organisation based in Dublin." Laura's work experience and studies led her to the realisation that she wanted a career working with migrants and refugees. "Helping others to access rights and opportunities is something I feel very strongly about," she says. 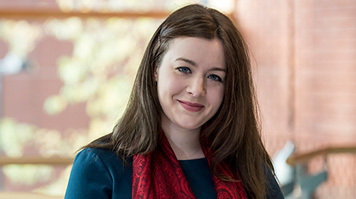 "I knew that I wanted to develop specific legal knowledge about Refugee Law and International Human Rights, so I began researching courses in Ireland and the UK – and that's when I found the LLM International Human Rights & Development at LSBU." After reviewing the course content, watching the course video and speaking to an LSBU lecturer, Laura was convinced that it was the right course for her, so applied. However, funding was still an issue so she also submitted an application for a Vice-Chancellor's Scholarship in the Merit category. "I was absolutely delighted and honoured to learn I had been awarded the scholarship," says Laura. "Having that financial support means that I'll be able to concentrate more on my studies and rely less on working part-time. It takes some of the financial pressure off, but it also makes me very proud that my academic work and achievements to date have been recognised. It vindicates my decision to give up a secure full-time job to move to London to study, and shows that making sacrifices to do things you are passionate about is worth it in the long run." As she looks to the future, Laura hopes to find work as an Advocacy Officer working with migrants and refugees in the UK. "I feel strongly about helping others to access opportunities," she says, "and it's one of the ways that I intend to make a positive contribution to society."